Conduction Junction, What’s Your Function? One of the pitfalls of sending your kids to a school where most of their classmates are in a higher socioeconomic range is the disparity in science fair projects. We gave up trying to keep up with the Joneses years ago, but it’s still impossible not to look at my kids’ homemade, hand-made projects like they are Charlie Brown’s Christmas tree in comparison to the store-bought projects they are competing with. That being said, this was the most fun year ever. Trillian, self starter that she is, conceived and executed a pretty in-depth study of taste buds, and whether they change as we age. She had men and women from 10 different age groups at church take part in a blind taste test of Coke and Diet Coke, and lemonade sweetened with sugar and Splenda. Amazingly, the data showed something we didn’t expect – there was almost no difference in taste-ability with age, but there WAS with gender (girls/women were typically more accurate). Trillian made a great display, and I’m quite proud of her. But Zaphod really made things fun this year. He had originally chosen a project that was FAR too complex (it’s something I might have attempted at the end of trade school), so he quickly found a very simple backup project. He wanted to measure the relative electrical conductivity of several materials, including different guages of pencil lead. This is right up my alley, something I studied extensively in my time at Nashville Vocational Tech. I was quite pleased when he asked me for help. I had a ball, teaching him about conductivity and resistance, about Onhm’s Law, voltage and amperage. He already understood A/c and D/C from our trip to the Edison house in Ft. Myers, FL. Zaphod had really gotten into a film about the current wars between Edison and Westinghouse in the 1880’s from a film we saw on the subject, so he ahd a basic understanding of the two types of current. We rigged a rheostat using a 6v battery, 16 guage stranded wire, and the bulb from a 6v flashlight. Zaphod loved learning how to strip the wires. We measured conductivity by placing the bare leads 2.5 inches apart, then 1 inch apart. (He was actually measuring in centimeters, but metric measurements never took with me). We recorded the brightness of the lamp visually on a scale of 0 to 4. We couldn’t afford a light meter, so exact measurements were not possible. We even used materials like stainless steel and aluminum foil. I did, however, draw the line at a glass of water (although this, too would have been fine with me), because I knew Lintilla wouldn’t be comfortable with it. In short, Zaphod and I found something we could actually bond over. Those things are getting few and far between, so I savored every moment of working on this project with him. He is, in general, smarter than I, so it was nice to venture into an area where I am confident in my knowledge, and he trusts me. It also brought back a lot of good memories from 1983 for me. Zaphod took his Explore test last week, and he and Trillian are taking the Iowas next week. That’s the downside of this time of year. Their brains have to be about to explode. In two weeks, they are on spring break. I am going to order them not to do any heavy thinking during that time. This idea came to me as the result of some kind of weird harmonic convergence. I read a series of news stories, supposedly disconnected, and suddenly a light came on in my head. The news stories? Another in the endless reports of company layoffs. A story about the education components of the recently passed stimulus package. An interview with Tony Dungee about his new passion: stemming the dropout rate in Indianapolis’ public schools. Bill Frists’ new Education task force. Well, I have an idea for Dr. Frists’ task force. We’ll call it the Education Corps. Nationwide, we have a huge pool of people who were recently taken out of the workforce, who had, up till they got laid off, used their training and skills in real world applications. It is here that I must pause and say that I think the world of teachers, that they have undertaken a noble calling, and are just like in any other field, highly competent in what they do. It is here that I must pause even further, and let you in on a secret: in my very short college career, once I discovered that pursuing a music degree was the height of stupidity for me, I turned my attentions toward a degree in secondary education. My discipline was to be American History. As a totally unrelated side note: Lintilla (whom I was dating at the time), had a degree in elementary education, although she had quickly discovered that the classroom was not for her. Anyway, it was at this point in my life that I discovered that Education degrees were the opposite of what I had thought. I had been under the mistaken impression that one majored in what they wanted to teach, and minored in Education. It’s the opposite (at least it was in 1986). How to teach, how to run a classroom, the different ways children learn, navigating the education bureaucracy – these are the highest priorities, the actual subject matter to be taught is important, but secondary. Y’all tell me if things have changed since I was young, back in the stone age. Let me again stress, I admire teachers, and believe they mostly do an heroic job. But, what if we gave them some help? What if we took a pool of people recently taken out of the workforce, and put them in the classroom, not as teachers but as Subject Matter Experts? The idea of SMEs is widely used in the private sector. Many of us are designated as SMEs, although we are also asked to do this in conjunction with our regular duties. I expect no such efficiencies from the public school systems, so let’s work with what we have. Let’s face it: materials and subject matter are often years out of date in the classroom; in my field, for instance,being that far behind means the teaching is worthless beyond the general theory level. Could a computer class not benefit from the knowledge of a recently laid off programmer or network engineer? Could an English Composition class not benefit from a recently laid off journalist? I am suggesting the Education Corps, not as a replacement for teachers, but as a supplement. The classroom would still be run by the teacher, but she will have an extremely valuable resource sitting right there in the classroom with her. Because it would be a combination Education / Unemployment Relief program, each position would be a one-year contract. This keeps Republicans happy with the huge amount of new spending this would require, because none of the Corps members would be sucked into the NEA. They would be contract workers, and everyone will understand that the SME will one day re-enter the higher paying private workforce. Because nothing in life is permanent, each year’s Corps members would be replaced by the next wave of laid off workers. Some hard cases would, of course, carry over from year to year. Neccesity is the mother of invention. We have a need to put skilled people to work, we’ve had a serious lack of worldly-wise Subject Matter Experts in schools for a very long time. If we are going to spend humongous amounts of money on schools anyway, why don’t we try something truly innovative and helpful to hurting workers and students alike? I was horribly saddened to hear about the passing of a family friend, Elizabeth Limor. I do not know if the Tennessean will have a story eulogizing this incredible woman, but if not, shame on them. She and her family have been pillars of the Nashville community for years upon years. To give yourself a little background, I would strongly recommend reading her story as a holocaust survivor. Others can, and should expound on her memoirs and life story. I’d like to take a moment, though, to tell how much she meant to me and my family on a more personal level. Like so many of our friendships, this one came about because Mrs Limor was a patient of Lintilla’s. Of course, Lintilla hits it off with everyone, plus they also had a personal connection. Lintilla’s mother was a teacher with the Temple playschool for 13 years and Lintilla spent a few years assisting her. It just so happened that one of the children that she worked with was one of Mrs. Limor’s grandsons. A few years later, Lintilla was working at a rehabilitation facility and encountered Mrs. Limor as a patient. Needless to say, a bond was made and they remained friends. Also, as you can see in the photo above, my son stole Elizabeth’s heart (pictured with another former patient of Lintilla’s and good friend of Mrs. Limor’s, Mrs. Inge L.). Since Lintilla keeps in touch with all of her patients, she was quite pleased when Mrs Limor moved into a community right across the street from our house, literally within walking distance. This started some wonderful days of visits – Mrs Limor was always generous in inviting our family to her home. 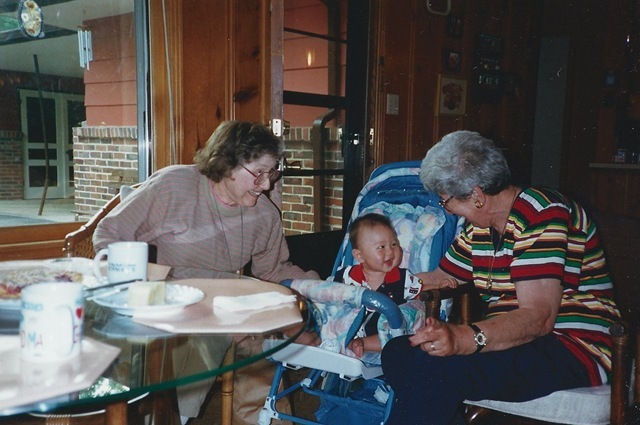 She made the most wonderful dinners (it was here that I discovered that I loved blintzes), and let the kids play with her overflowing supply of stuffed animals (kept, no doubt, to entertain her grandchildren and great-grandchildren). She was always quick with advice, and although sometimes I had trouble deciphering her still thick accent, the meaning of what she was telling us was never lost. She gave us signed copies of her book; after reading it, I decided she was the toughest (strongest) person I’d ever met, vowed to quit complaining about how rough I have it (I fail miserably sometimes). I regret that we lost that book in our house fire and would love to have another copy. It’s hard to express the gratitude I have to Mrs Limor; she was a grandmotherly figure to my kids when they most needed it. We are all better off, having known her. There is a wonderful entry in the online guestbook in memoriam for Mrs Limor. It says, “Elizabeth loved to collect people. I am honored to be part of her collection. She will always live in my heart.” This says it better than I could. Lintilla and I would like to offer our sincerest condolences to Mrs Limor’s family. She will be missed.